What’s the difference between a $200 Player and the $700 Player? While there are a lot of questions that customers ask, that is probably the most popular question that gets asked day in and day out, and rightfully so. There is a wide variety of players and they differ greatly in price, processing power, size, outputs, and operating systems. The commercial integrator needs to be able to explain that there is a BIG difference between the entry level player, the nicely equipped model, and the top end player. Digital signage professionals know that selecting the right media player really comes down to one thing…content. Understanding what content will be displayed – now and in the future – is key to determining which player will work best. It might help to explain to the client that a media player is essentially a regular computer just like that tower sitting on the floor under the desk. They both have a mainboard, processor, memory, hard drive, and require an operating system. The difference is size. Most media players use a small form factor (SFF) footprint. This small, lightweight, footprint is ideal for digital signage as the player typically gets mounted behind the display, to the wall, or in the ceiling. Digital signage players, or media players can deliver content to a basic single screen static menu board with text and some images, to a more complex dual screen setup with scrolling text, animation, live video feeds, and interactive widgets. The more a client wants to display, the more processing power will be needed to view what should be crisp, clean images without being jittery. In addition to the content, another key question is where will that content be stored– locally or in the cloud. Some signage software or content management systems (CMS) operate with content stored on the local hard drive of the player. To use a cloud-based CMS requires an active Internet connection and streams the content over the Internet. The option will be determined by the digital signage software selected. Both have pros and cons, which is a whole different topic. Only after determining the content requirements, can player recommendations be made. An entry-level player usually consists of a lower power, lower cost Intel Atom or Celeron processor with either 2GB to 4GB of memory. A smaller SSD drive, WiFi and Linux or Windows OS rounds it out. These players are a great recommendation for menu boards, directories and other displays with a lighter content load. No client wants to spend more than they have to, and these lower cost, entry-level players are a reliable option, as long as your clients understand what they are buying, and have realistic expectations. Popular choices are the Intel ComputeStick or Intel Celeron NUC. These more expensive media players with faster processors, more memory and multiple outputs can handle pretty much anything you throw at them. Typically configured with an i5 processor and 8GB of memory featuring the latest Intel HD onboard graphics, or a dedicated graphics card. Often powering more than one display, you can showcase content across multiple screens with a single player. These players are an excellent recommendation for video walls. If the project requires displaying multiple videos in different zones, scrolling text, and interactive widgets a high-end player may be required. 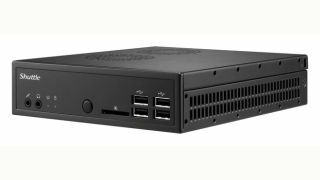 Popular choices are the Intel i5 NUC and the Shuttle SH170R6 with Matrox graphics card. So before you recommend any media player for a project, take the time to talk with your client about what content they want to display – now and in the future. Advise them not to buy the $200 media player and expect that it can display videos and scrolling text smoothly, while at the same time you can assure them that there is no need to spend $700 on a media player to support the menu board at for a small restaurant or building directory in that will have nothing but text and images. Research and recommend the player that checks all the boxes, and chances are, once the first player is up and running, your client will be sufficiently comfortable to keep adding and adding and adding, because the possibilities are endless. Brandon Jones is an entrepreneur involved in the small form factor PC market. Since 2001 Jones has been actively targeting this niche market providing solutions for RV’s and yachts, medical carts and exam rooms, and now the digital signage market. Brandon Jones is the founder & CEO of TheBookPC.com, Inc.